Joy Creek Photo Archive (c) all rights reserved A clump-forming perennial with fleshy, lance-shaped leaves. The 3-petaled, reddish flowers appear in terminal cymes. Individual flowers are about 1.5 inches across. 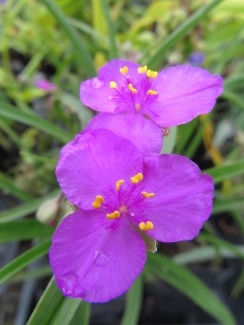 Tradescantia 'Red Cloud' is easy to grow and useful in a part-shade border. Early summer to early autumn. 18 in. x 18 in.